Happy Easter Everyone. The Easter Bunny visited our house last night and I'm afraid to say that both my kids ate chocolate before breakfast! 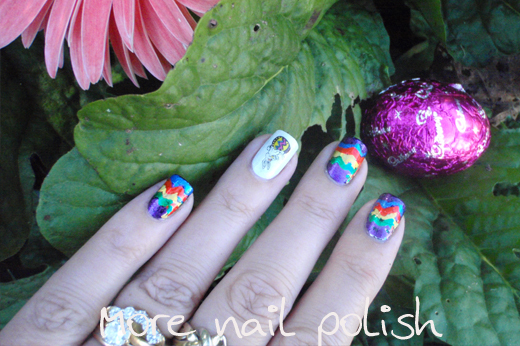 For today, I'm sporting these rather hideous looking Easter egg foil nails. I figured it didn't matter too much how messy and uneven they are, because foil covered eggs are always messy and crinkled. I created these nails by first painting my nails black, and the accent finger white. 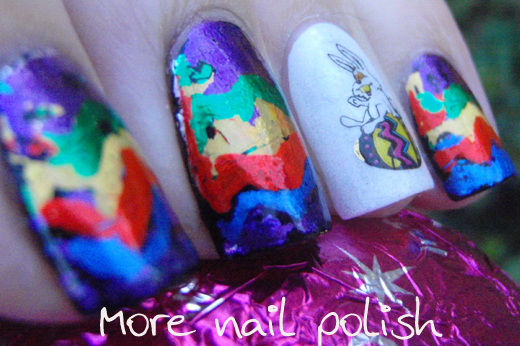 I then applied nail foil glue in various zigzag patterns and stuck down different coloured foils. 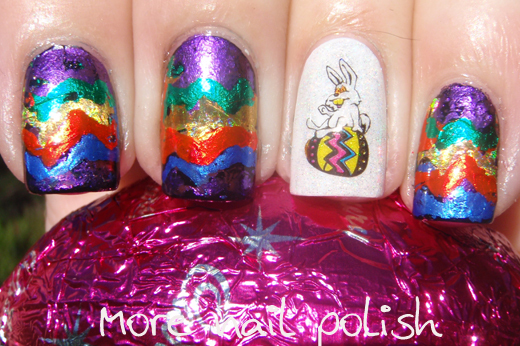 On the accent finger I put a layer of a Spectraflair topcoat and then an Easter water decal from an old holiday set I have. These pictures are taken in the shade, because it was so hard to get a decent photo of this in the sun, due to all the reflections off the foil. And they really do look much better in real life. Stupid macro shots showing ginormous nails! Here is one in the sun. 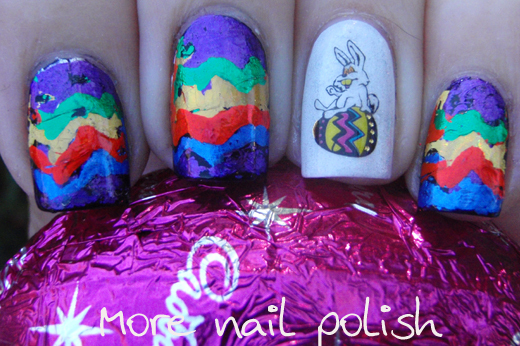 I have to say, may nails really do look like Easter eggs. See how much better it looks from a distance! And here is a close up of that Easter water decal. WTF is that bunny on? Red eyes and yellow teeth!! No more Easter Eggs for you bunny! I hope you all have a happy and safe Easter. They do really look like eggs! Happy Easter Cathy! I don't know how I should feel about the bunny. Should I laugh or cry? Perfect! 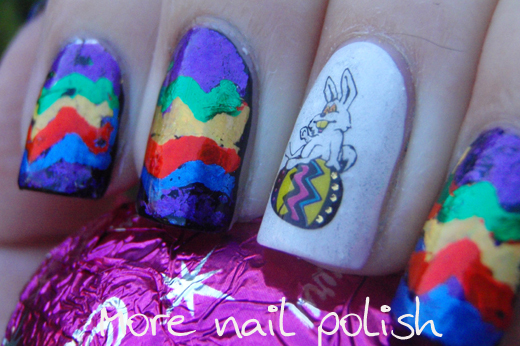 Just like Easter Eggs!! I love the foil eggs though. 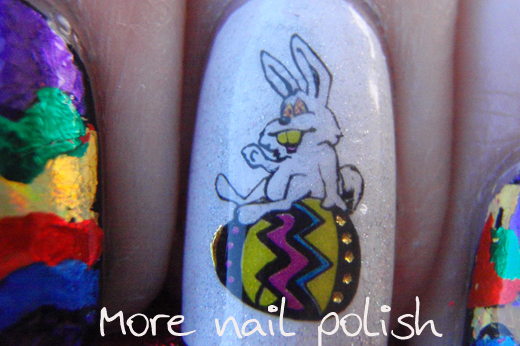 Totally captures Easter and I like seeing the bolder colours in an Easter mani. Happy Easter! I'm sure most kids munch on chocolate before breakfast on Easter. I know I did as a child. Love the foil, looks great! Happy Easter! Ha! 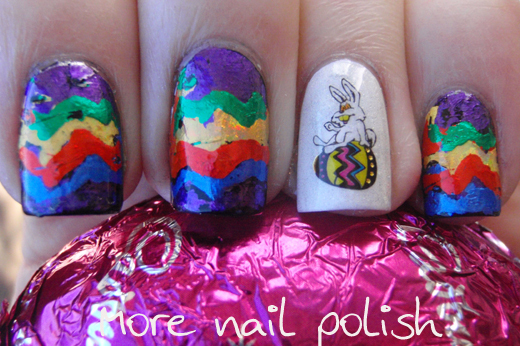 Love the idea of using foil for an Easter mani, they're so cute. Reminds me of all the art projects of tearing the colored tissue paper and apply to eggs or to just paper to make stained glass looks. Now with the foil tissue papers (did not have when I was growing up -mylar was only in the space industry WAY back then I am sure). But love your bits of foil you used. It could have been a total mess - but it came out great! Super idea! I have to try it. I don't think like you said - the messy look comes across to those who look at your nails from a little 'normal' Western culture face to face distance. And so what if they are crinkled? That's part of the art you just tell folks! I cannot imagine getting the foils flat!